In both obvious and subtle ways, technology is changing the world as we know it. While we’re mostly familiar with the major shifts in medicine, transportation and communication that have been enabled by advances in technology over the last century, there’s no shortage of examples that demonstrate how technology is also influencing our creativity and its usage in our daily lives. From the media we consume and the methods we use to distribute it to the transition of messaging from the static to the dynamic, technology is continually fueling our future and shaping our world. In the realm of marketing, the goal is often to connect communities around a shared concept while providing compelling ways in which they can engage. At the core of these initiatives is an opportunity to overcome an obstacle through technological innovation as campaign creators attempt to move marketing beyond traditional messaging and into the realm of reactive and interactive communication. As an open platform with near limitless possibilities, Unreal Engine is becoming more and more useful in assisting with the achievement of these goals, which is allowing content creators of all types to be limited only by their imaginations. So, when adidas wanted to tap into the power of technology to evangelize the release of its latest footwear, the adidas NMD, while also connecting its European audiences in the real world, the company commissioned agencies Your Majesty and Act Normal along with Amsterdam-based designers Naivi to bring the concept to life. Comprised of veterans from the film and gaming industries, Naivi designs and develops custom software solutions for out-of-the-box projects. The company’s core belief is that there are no boundaries between creativity and technology, which is why they welcomed the challenge presented by adidas. Well, I recently caught up with Naivi’s Coen Klösters to discuss the design and implementation of the adidas NMX cube project from concept to completion. Thank you for taking the time to discuss this project! For those that are unfamiliar with what happened here, can you please give an overview of the installations you created for adidas? 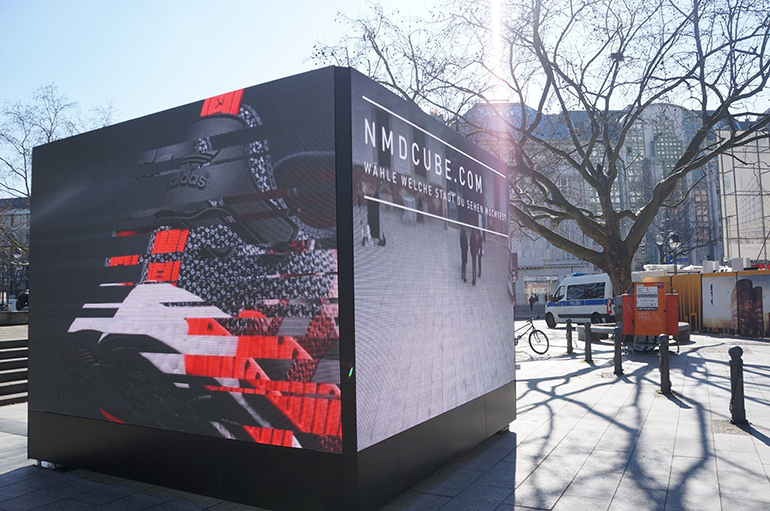 The adidas NMD cubes are large scale interactive LED installations, commissioned by adidas, that were placed in different cities around Europe. The main purpose of the cube was to promote a new type of shoe, the NMD, that was released that week. But adidas did not want a default advert panel, they wanted something more engaging, more cutting edge. Your Majesty, an Amsterdam / New York based design agency we always love to work with, were tasked by agency Act Normal to produce a four-faced LED cube (square) that would display not only the shoe and adverts, but also other types of content such as personal pictures that people send in. The cube also acted as a video portal, showing the other streets and corners of Europe where a similar installation was placed. In order to realize this concept, custom, highly optimised software was a necessity, and that's where we came in. This project seems like it was a very fun and interesting one to put together. How did your role in it come about? We started Naivi about a year ago, based upon two strong beliefs: projects profit when we translate a creative idea into highly optimised, custom designed software, and that high end real time graphics are the way to go for just about any visual presentation, not just when applied to games. Most of us worked (and some still do) at Guerrilla Games in Amsterdam and have experience in the CG industry, having worked for companies such as Cinesite, Side Effects and Industrial Light and Magic. We use these skills to write software or create installations for different real world other environments such as as museums, live visuals for shows in clubs or at festivals, commercial installations and sometimes also games. The main problem in terms of realization of the adidas NMD concept was that no existing software application matched up to the requirements, and Your Majesty felt we were the right guys for the job because of our technical background and focus on real time technology. Luckily, writing custom solutions is what we enjoy the most! Creatively speaking, did your team know exactly what it wanted to do from the start or did you experiment with a variety of ideas? The design agency had a clear idea of what the cube had to look like and what features in terms of visual fidelity and interactivity it had to support. A lot of things were up for grabs and for us to fill in, and we enjoy collaborating in this way. But as is often the case, deadlines were tight: the total turnaround time was about four weeks. In that short period we had to find a capable LED vendor that could build the installations, work out the look of the content, design the cube, get all of that approved by adidas and write the software to support all of the required features. Luckily, we knew more or less what was expected and started coding and making Blueprints straight away, so we had a decent framework in place from the start. The installations were placed on the streets of nine major European cities: Stockholm, London, Hamburg, Berlin, Frankfurt, Munich, Rotterdam , Milan and Barcelona. How did the selection of these cities come about? These are all major European cities that have an exciting feel to them. Cities such as London, Milan and Berlin have a certain edge that correlates with the urban image of the shoe. Technically speaking, is there anything prohibiting a world-wide installation of the same nature from being created? No, absolutely not. The application is capable of playing localized content (different content based on the language of the country) and can easily be configured using a simple XML file. In fact, due to its success, the campaign got extended to more cities in Germany (Hamburg and Munich). After our first run we had to implement a night time feature but other than that nothing had to change in terms of code. 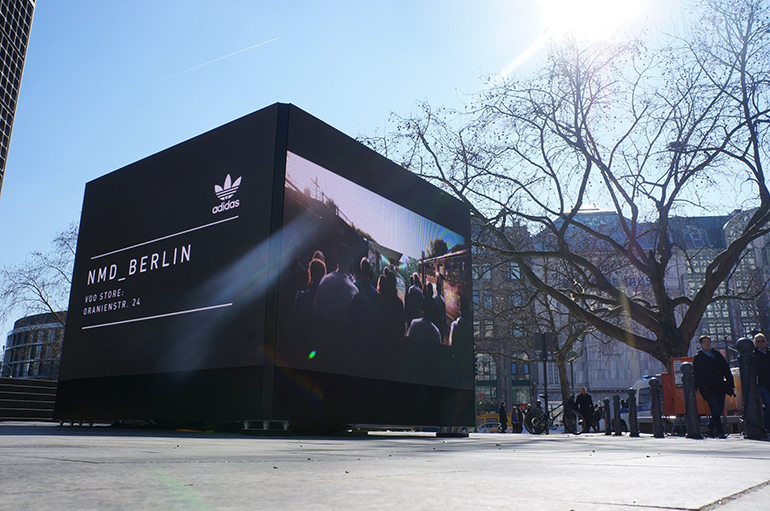 The interactive LED cubes were connected to various webcam and social media feeds, allowing adidas fans across Europe to respond to each other in real-time. With that in mind, what type of social interaction did the installations inspire? adidas wanted fans to connect and share their experiences. 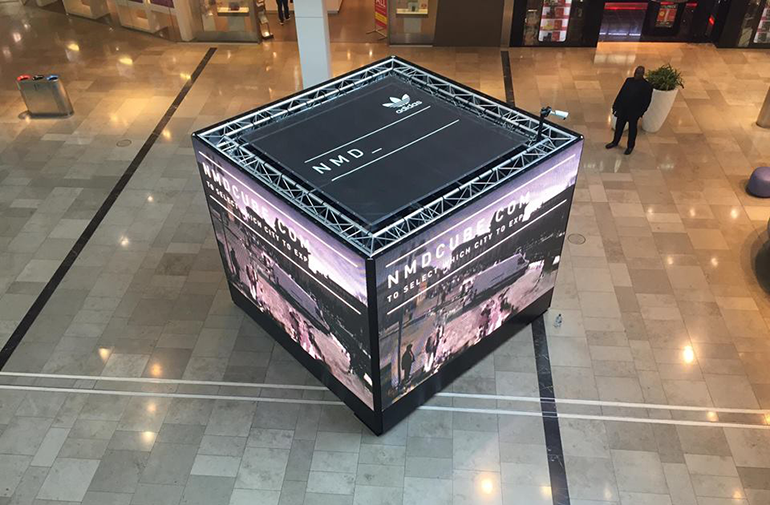 Viewers were asked to post pictures to the installation using the #NMD hashtag and within a minute that picture would be on display on all the cubes spread across Europe. I believe more than 10,000 photos were shared. Fans were also able to vote for the city they wanted to see next, using a web application developed by Your Majesty. Based on the amount of votes that came in, the city with the highest amount of votes (local to their city) would be displayed on the cube, like a little portal. To make this work we gave every cube a unique identity. The application continuously pulled the server for new data and decided what to do next based on various kinds of user input. This is, in my opinion, a fresh new way of reaching out and connecting people. All very reactive and interactive. In order to realize the vision for this project, your team had to write a custom sequencer in Unreal Engine that allowed three different types of content to play on every individual side of the cube. What were those types of content and how did they fulfill the purpose of the project? The content had to be displayed as a single spread over all sides. Therefore the cube had to support over 1,419,857 different combinations of sequences and two different output resolutions. Traditional media players can’t do this on the fly. 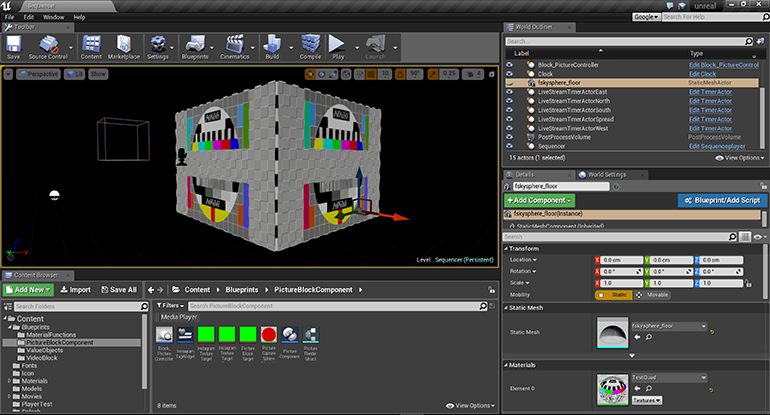 The Unreal Engine-based application renders any sequence combination at any time based on a set of preconfigured application settings. Next to the amount of possible sequence combinations, the content had to change based on the latest Instagram data or live feed. The application is able to render the Instagram feed to textures on the graphics processor with zero latency and display the results immediately. Video playback was handled completely threaded, allowing us to pre-load movies that were about to play and display the result immediately on content switch. The live feed was accomplished using a custom webcam driver that streamed in the feed from the camera somewhere in Europe. One of the slogans of the NMD itself is “The past empowers the future”. How do you feel that Unreal Engine is empowering campaign developers with the ability to take traditional marketing techniques to all-new levels? Traditional marketing in the public domain often limits itself to static, pre-rendered content. This can be in the form of a poster, video commercial or other type of static outlet. If the content changes it's because of a playlist running in the background. The video will never change, nor will the poster. People are surrounded with social media and able to connect to each other in real time. Their digital feed of information changes rapidly, and they're expecting that in the real world as well. 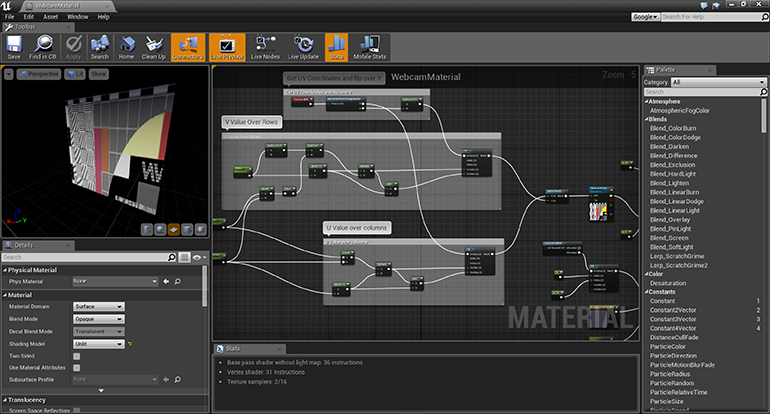 Unreal Engine opens doors when it comes to dynamically created content displayed in an elegant fashion. Our framework allows you to render new content in real time without having to sacrifice polish or visual fidelity. If you ask us, long gone are the days of endless render times to get something to look good. Interactivity enforced by modern day gaming engines offers infinite possibilities when it comes to future marketing techniques, something games have always done well. Although Unreal Engine has typically been utilized within the gaming space, how do you see the tools and technologies it affords impacting the worlds of marketing and enterprise? I think it's only a matter of time before we see more game engine technology utilized in marketing. When we first heard of Unreal Engine becoming open source we couldn't wait to get our hands on it, being able to bend it to fit our rules and desires. For us, it was a great incentive to push the software's boundaries. I believe a lot of people are currently doing cutting edge work in domains outside of gaming, pre-visualization for example. The main issue is the divide that exists between people knowing the more traditional tools (such as After Effects, Premiere, 3DSMax) and people making games. Bluntly put, it seems that people in games are more tech-savvy and often know how to code or at least resolve technical issues. Blueprints help ease the pain yet the learning curve remains steep. But it's the only way forward. Stop keying lines, write a shader instead! You can do it by connecting nodes. As you might have noticed, we're all big node graph fans. Why did you choose Unreal Engine for development of this project? We explored several options, including OpenFrameworks, Processing and Unity. We decided to go for Unreal because of it's threaded video playback support, the option to dynamically load and render textures, combine C++ code with easy to create node graphs (Blueprints), execution speed and the possibility to stream in a webcam feed. Although webcam streaming wasn't supported yet and we had to write our own implementation. Is the team at NAIVI currently working on any similar installations or applying Unreal Engine to other projects? We are, although I can't say much about it. It's not in the realm of advertising but still very much out of the box. In the past we used Unreal Engine for a commercial projection mapping project, live show visuals and a VR installation for a museum. The applications are pretty much infinite, especially when you combine it with your own C++ code or an application such as Houdini. Interested in finding out more about Naivi? Visit their official website and LIKE them on Facebook! You can also visit the Unreal Engine Enterprise portal to discover more about the engine’s impact on the world of marketing, business and beyond.